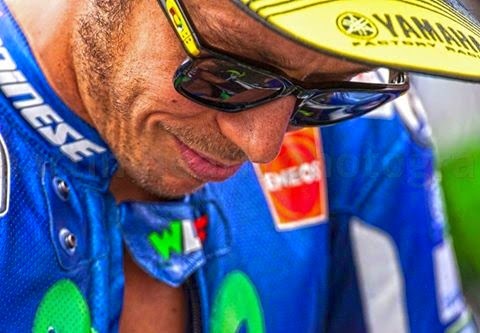 Valentino Rossi (Urbino, February 16, 1979) is an Italian motorcycle racer. Among the most titled riders of the championship, by virtue of the nine world titles - the first in 18 years - is the only rider in the motorcycle history to have won the championship in four different classes: 125 (1), 250 (1), 500 (1) and MotoGP (6). Rossi has always used the number 46 on his bike, although he had several times the possibility to use the number 1 as defending champion; 46 had previously been used in the World Championship by his father, former pilota.Spostatosi from tiny to Tavullia, Rossi starts to become familiar with the engines as a child, immediately showing his talent. Start with the kart thanks to his father Graziano, who races in the World Championship in the seventies; then move very quickly to cheaper minibike, which at the time had not yet had the development today, and take the first licensed as a pilot of Moto Club Catholic association pioneer of racing minibike. Makes his first experiences and races at the track Motorpark in Cattolica, the first IMF approved. At 13 proof for the first time the Aprilia Futura 125, but the debut in the championship Sport Production does in 1993 riding the Cagiva Mito 125, managed by Claudio Lusuardi. In 1994 he participated simultaneously championships Sport Production and Italian GP, managing to win the championship of the derived series and to gain experience on the prototypes by GP. The following year he won the Italian championship in the 125 class and ranks third in the European in the same category. Since her debut in the 125cc class, in 1996, until the 2010 Mugello GP Rossi has never missed a race.